A good appreciation of HSE risks in your area of responsibility helps to correctly direct resources for improvement. 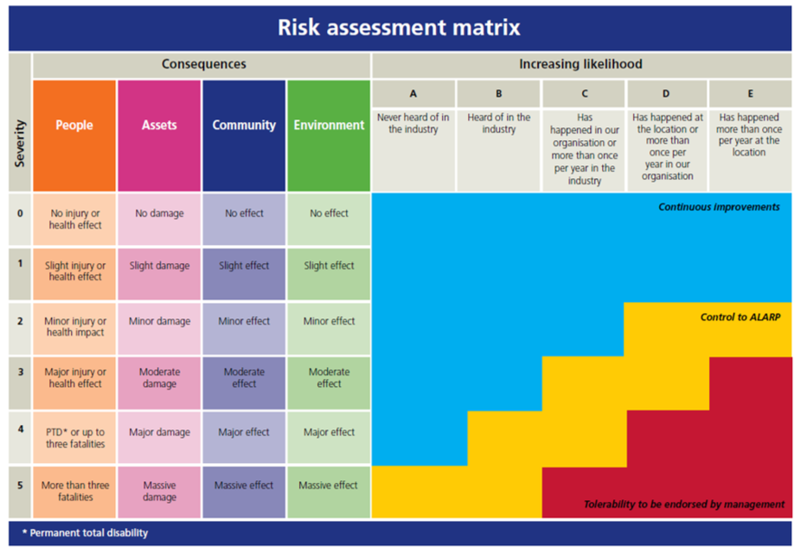 Risk Assessment Matrix (RAM) is a tool to rank and assess these risks, and discuss what changes need to be made so that the risk is as low as is reasonably practicable (ALARP). Ensuring that risk is managed in a structured and rational way is a necessary part of a safety management system. Rationalising risk in this way can help better allocate resources and ensure that adequate barriers are put in place to prevent incidents. Applying RAM properly and frequently is a natural way to communicate and plan for HSE improvement. RAM can help managers better appreciate their personal roles in managing the HSE risk in their area of responsibility, and can help them come to a good understanding of their role in demonstrating risk is managed to ALARP levels. Apply the RAM properly and frequently as a natural way to communicate and plan for HSE improvement. As a group exercise, consider the potential incidents that could happen and plot that incident on the RAM depending on its severity and likelihood of happening. Consider how the risk of the incident happening can be reduced through changing how the work takes place or building in extra safeguards. Assessing the risk of a particular scenario should be done in sequence, i.e. first the potential consequences are estimated and only thereafter the likelihood of such consequences occurring are assigned. (A scale of consequences from 0 to 5 is used to indicate increasing severity). After assessing the consequences, the likelihood on the horizontal axis is estimated on the basis of historical evidence or experience that such consequences occurred. Ensure that the exercise involves people at all levels who are involved in the tasks being discussed as they will understand the problems and know which solutions will and will not work. But remember, you need to include those responsible for planning activities (managers and supervisors) otherwise changes may not happen.